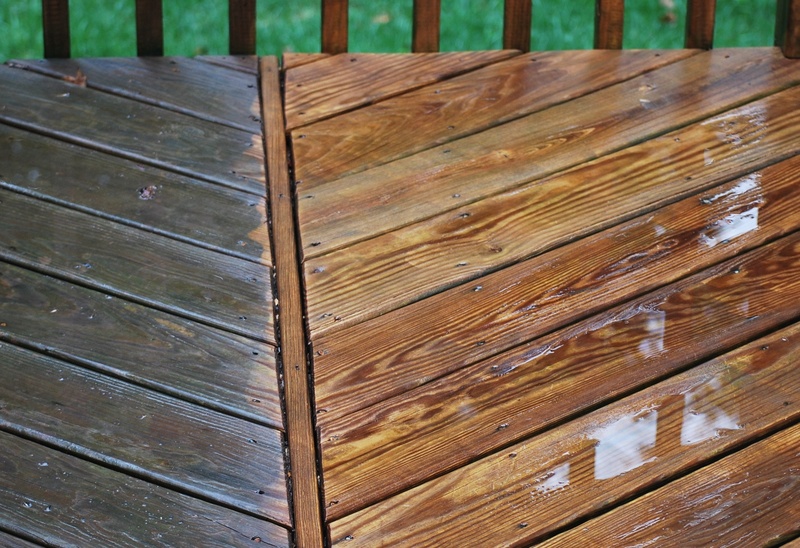 Our deck had become treacherously slippery, and so this past weekend, I borrowed a power washer from my dad. 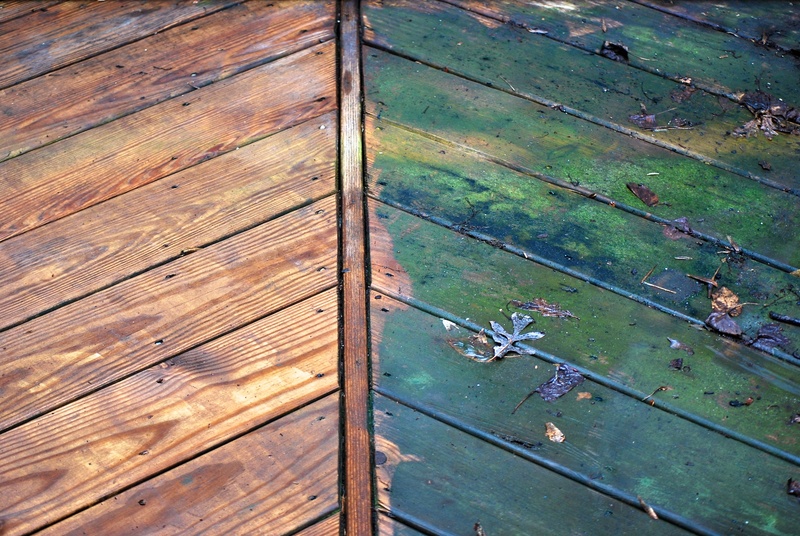 My husband got started, and I stared out the back door, mesmerized by what I was seeing: years’ worth of dirt and algae and grime stripping away like green paint, revealing the beautiful wood grain of the deck underneath. I was amazed at how dirty the deck had become without our even noticing it (and even after we saw the algae begin to appear, it took a long time for us to act on it). What I had thought of as merely grayed and weathered turned out to be filthy and gross. Pretty soon, I went outside and asked for a turn at cleaning. For a brief moment, I was afraid it would be like Tom Sawyer and the white-washed fence, that I would soon regret asking for a turn at the work that looked like fun. But it was a cool, overcast day, and the work was so satisfying in an immediate way that I power washed the deck longer than I expected. My husband and I agreed that the work offered a zen-like quality that many chores do not. Now, to be honest, he worked at it much longer than I did, and he even tackled our outdoor furniture. Again, I watched as our bench transformed from looking old and weathered to practically new. It struck me that our lives can get similarly weighed down with dirt and gunk, too, without our even noticing it. Bad habits can pile onto other bad habits, and before we know it, we don’t even recognize that anything is wrong. Old griefs and hurts can cling to us, slowly changing our personalities. Bitterness can take root and spread like a poison that seeps into the cracks of our souls and threatens to break us apart. We don’t even understand that there is something treacherous in what is overtaking us. In this passage, God is promising a new thing. He cautions against getting caught up in what is past and becoming so consumed by what has already happened that we don’t even notice the wonderful new things God is causing to happen around us. Maybe we get tangled up in the past because it seems so much more tangible to us than the future. We know what happened in our past, and even if it was pain and hurt and anger and sadness and mistakes, we may find it easier to cling to than an as-yet-unfulfilled promise for our future. I mentioned Lysa TerKeurst’s new book Unglued to you in last Wednesday’s post. Early in the book, she talks about letting God chisel us just as Michelangelo chiseled his famous sculpture of David, removing what shouldn’t be part of us in an attempt to lead us toward perfection through Him. When TerKeurst is confronted with a situation where she’s tempted to lash out at someone, she has started saying, “Let God chisel.” In other words, let God use this experience as an opportunity to remove some of the dirt and disgust from my past and from my personal tendencies so that I can become who He wants me to be. After we cleaned the deck, my husband and I realized how desperately it needed a new coat of stain, a new protection to prolong its life. Our work isn’t finished. By asking God to power wash me, I know His work won’t finish there. For He has promised a new thing, and for me, that promise includes His protective coating, too. How about you? Are there things from your past that you’re clinging to … or maybe they’re clinging to you? Is there something in your life that has piled on to weigh you down? Maybe a bad habit has snuck into your life without you realizing it? Are you willing to let God power wash the gunk out of your life so you can become shiny and new and beautiful for Him? This entry was posted in flourishing tree and tagged future, griefs, Isaiah, Lysa TerKeurst, past, power washing, Tom Sawyer, Unglued by hopesquires. Bookmark the permalink. While I’m not a religious person, I find this post resonates on many levels – and reminds me my deck needs washing 🙂 Thanks for sharing! Mark — I’m so glad this resonated with you. And sorry to add to your chores, but as I’ve said, it’s one of the most fun chores I’ve done in a long time.